Is there a sports car that typifies the 1990s more than the Mitsubishi 3000GT (and its mechanically identical companion, the Dodge Stealth)? It seemed so exotic at the time – almost like a Ferrari, except that you might actually be able to afford it. Well, you could afford it if you kept to lower-level models. At the top of the 3000GT food chain, the VR-4 stickered at about $40,000 in the early years. That was Corvette territory. The lowliest 3000GTs stickered at about $17k at first. That’s equivalent to about $30k today, definitely within reach of someone with a middle-class income who wants to look like he drives a fast car. A buddy of mine had a red 1990 or ’91 VR-4. When he rolled up in it for the first time, I admit to feeling a little weak in the knees over how gorgeous it looked. When I got in and we drove around a bit, I quickly noticed how nose heavy it felt and how it handled a little ponderously. No wonder; it weighed 3,800 pounds. I could never sort out whether the all-wheel drive and four-wheel steering helped or hindered handling. But damn, was it fast. 60 arrived in about 5.5 seconds – the 300-hp twin-turbo V6 was very able to motivate that much metal. And the braking was outstanding; it felt like God Himself was reaching down to stop the car. But his VR-4 replaced a first-gen Mazda RX-7, which I quickly came to miss. Even though that RX was pretty used up, it was still very quick and nimble and just a joy to drive. My consolation was all the attention we got while cruising in that VR-4. Lesser GT3000s were much lesser. Packing a 222-horsepower V6, low-line 3000GTs were said to be more show than go, like a contemporary six-cylinder Mustang or Camaro. 222 hp sounds like a lot, but it’s apparently not enough to move this much car with true sporty zing. This SL is one step up from the base model and offers mostly extra interior comfort and convenience goodies. And it’s wearing Champagne Yellow Pearl paint, which was available only in 1994 and 1995. So many of these rolled off the line in red that I’m not sure I’d notice one in that color today, even in a sparsely populated parking lot. 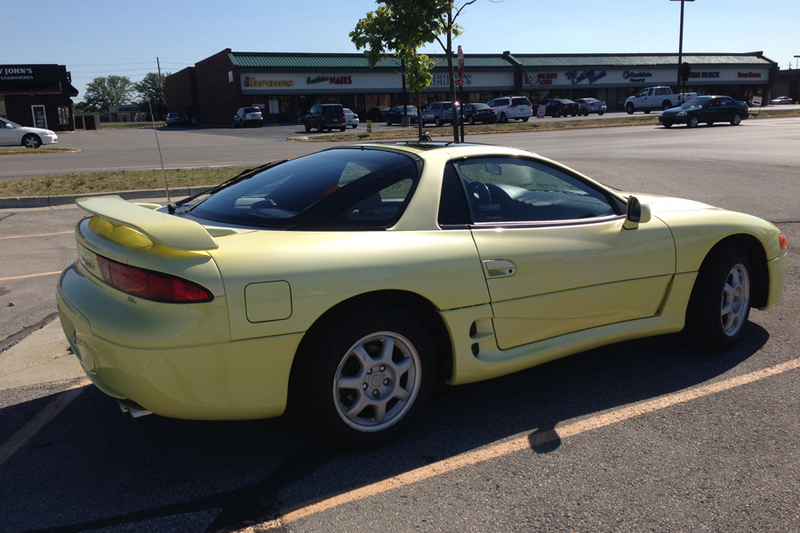 Unfortunately, the 3000GT doesn’t wear this color well. Maybe that’s why it got my notice – oh em gee, what is that? At least this 20-year-old sort-of sportster still looks new. I have also heard that the repairs on these often were so wallet draining that most of the 2nd and 3rd owners gave up when minor issues cropped up. 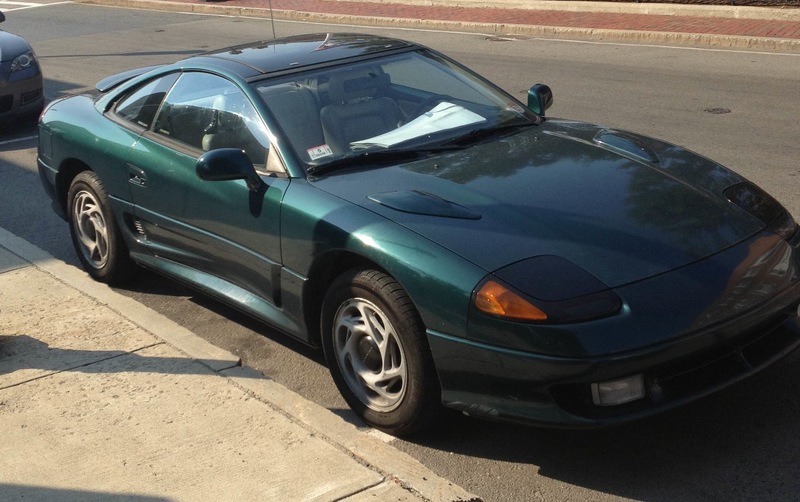 Although personally I always liked the Dodge stealth just for the sheer audacity of Dodge selling that car. Imagine the Dodge showroom where the first Stealths would have shared showroom space with the still in production Diplomat! A friend of mine had a V6 one as a driver, and repair were expensive, and nothing in the engine compartment was accessible in the least bit, except for the dipstick. The reason the base version of these were so slow was that they had ~160 hp, not 222. The mid-line models got the 222 hp version. Also, if you didn’t get AWD, these things were FWD. No honest-to-god sports car, especially one that big, can be FWD. The thing I remember most about these vehicles was in a C/D review, they mentioned that the only way you could actually sit in the rear seat was if you were a paraplegic. Leg room was non-existent. If you were tall, when the front seats were in their most rearward position, they actually butted up against the rear seat cushions. 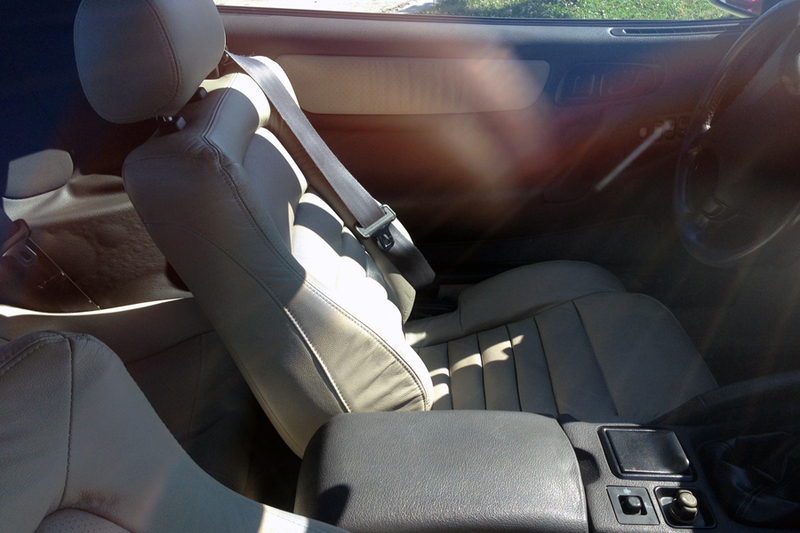 The rear seat of a 3000GT/Stealth made the rear seat of a seventies’ E-body Mopar seem like a minivan in comparison. You can see it in the interior photo above. Yeah, those seats serve only to lower the insurance rate. This car was of era when all the Japanese brands had a “supercar” available in turbo and lesser versions. Dynamically this was the worst compared to the 300ZX, Supra, and RX-7. Proof that car purchasing is completely emotional: why would anyone buy the 3000 instead of the 300ZX or Supra? Comparing the four turbo versions doesn’t change the conclusion with the RX-7 being the driver’s choice. Did anyone else notice the competitor (4th gen Firebird/TA) in the background? Yeah, when I cropped the photo I deliberately left it in. Funny, I always imagined that the Stealth/3000 is what a FWD F-body woulda, coulda, sort of been like if the ill-fated FWD F-body GM-80 had ever gotten off the ground. Wasn’t a bad car at all. I bought a VR4 new in Dec 94, and put 137,000 miles on it in 2 and a half years. Other than routine maintenance, the only thing it needed was a water pump at 97,000, and I drove it hard. Fastest I ever saw was 157 indicated, on a remote long straight desert highway. It felt like it was on rails at that speed. Not the nimblest car, but I did manage to best a turbo Supra or 2. No one bought these for the back seats. They were a comfortable fast tourer. At least for me, never felt tired after a long day behind the wheel. I enjoyed that car til the day I got rid of it. They didn’t hold value well, and tended to wind up in the hands of owners who couldn’t afford the upkeep, so they went downhill fast after the first owner or two. Still miss that car occasionally, especially on long remote roads. Oh, and mine was polar white, not red, never did like red ones. Holy crap, Amigo! 137,000 miles in two and 1/2 years? That’s roughly 5,000 miles per month! Did you have 30 oil changes to go with that 30 months of driving? I know there are people who have jobs that force them to drive tons of miles I just couldn’t picture one of those people driving a VR4 – I think I would have wanted something soft, comfy, and quiet. 137,000 is a lot in 2 and 1/2 years, but it’s surprising how much some people drive. My mom is recently retired, yet in 2 months she’s already put over 5,000 miles on her new car. When she was still working, in the first year of her longer commute due to moving she put 40,000 miles on her old BMW in 9 months. For comparison, in the first year I’ve owned my current car, I’ve put under 9,000 miles on it. Well, when you put it that way… I’ve never actually thought of the miles per month with that car. I only worked 2 miles from the house, but it was a high stress time in my life, and my way to relax was getting in the car at night and driving. Some nights I’d put 500 miles on it out in the desert. It didn’t take long at 100+ on empty stretches of road. My girlfriend and I at the time would do some rather outlandish things, L.A. to San Francisco and back for dinner (she loved to drive it more than I did), L.A. to Vegas and back in one night for a show, or just seeing how far we could get before we had to turn around and come back. We never thought of ‘how far’ somewhere was, but ‘how fast can we get there?’ It never let us down, and we always looked forward to driving it the next day. I remember reading that Mitsubishi deliberately styled the front of the cars to look like a Shogun warrior helmet (may be wrong on that one). At the time, 95 thru 97, the car alway attracted attention, especially in small out of the way towns. The active aero suspension did a great job at speed. At just over 100 mph, you could feel the car ‘squat’ to the highway, and from there to top speed it felt like it was nailed to the road. In straight line high speed driving it was a rock. For the time, they were a helluva car. I’ve always been fascinated with the Mitsu/ Dodge pair since I first laid eyes on a blue Stealth in the dealer showroom in late ’90 when my mother was taking her Dodge 600 in for service (again). My usual routine was to walk around the lot and loudly call out “ugly”, “box”, “junk” as I passed each car (b/c the unsolicited opinion of a 14 year old is important to anyone in earshot), but walking from the service write-up to the lot through the showroom, I was entranced by one of the most gorgeous cars I had ever seen. Literally mesmerized I just gawked the entire time. Maybe there was hope for Dodge/ Chrysler? 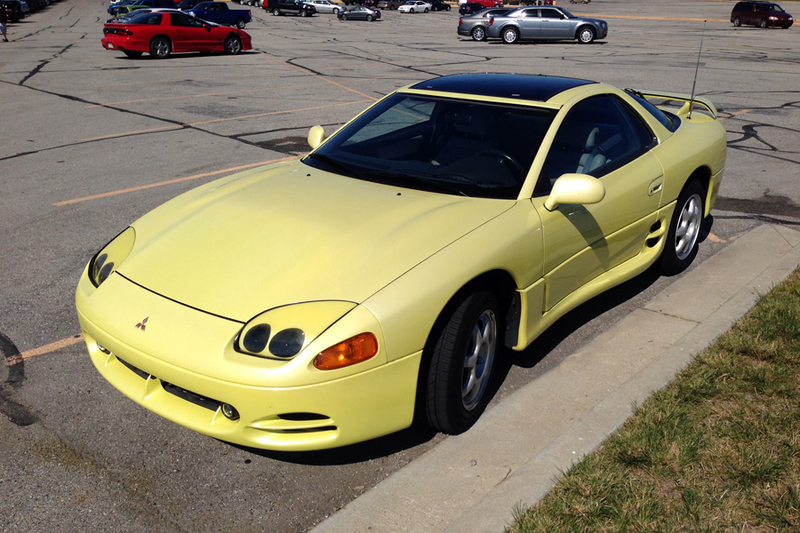 A few years later, the owner of the company that I worked for in college showed up in what I first thought was a Ferrari- it was a bright yellow Mitsubishi 3000GT Spyder. As he put the top up, I wandered outside transfixed seeing the metal automatically move, flip and unfold (Transformers are REAL!) to form a hard top closed coupe. Completely oblivious that maybe the boss wouldn’t like me shucking my responsibilities to stare at his car. Back at that epoch my wife was insisting I buy a new car. She wanted me to get one of these. I was speechless. The horror of it, the tastelessness. The sheer gaudiness. The I remembered she owned a Datsun B210 when we met. I then discovered she liked the Godzilla school of automobile design. It always amazes me that these cars started production in 1990. Sure the aero revolution had begun, but they still looked way ahead of their time (and by that I mean 5 years or so). I actually preferred the Dodge in terms of styling. Nonetheless really cool cars, even if they’re largely forgotten today. I dont think we got the non-VR4 versions in Australia, although they weren’t badged as such here. These also had some active-aero elements didn’t they? Moving spoilers from memory. Yup, both front and rear spoilers adjust themselves either on command or at 50 mph. I think the most important single thing to remember about these cars is that they were based on the Mitsubishi Galant, so for all the technology Mitsubishi heaped on them (which was sometimes impressive and ahead of its time), they were at heart largish FWD sedans with MacPherson strut front suspension. I liked these when they were new, but honestly, a Galant VR-4 (which had a lot, though not all, of the same hardware) sounds more appealing. 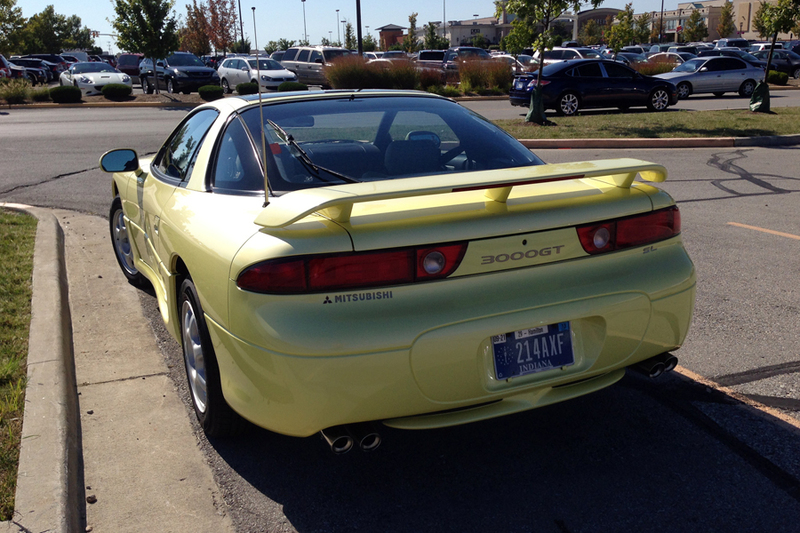 I spotted this Dodge Stealth a couple of months ago, not far from my house. I think they were slightly better looking than the 3000GT. I never warmed up to these. The headlights with the strange covering was quite off putting. The Stealth didn’t have it and always looked better to my eyes. These (and the Stealth) seem to have quite a low survival rate for a sporty car. I haven’t seen one of these in the wild in a shockingly long time, especially considering they used to be EVERYWHERE. Even VR-4s were fairly ubiquitous. Stealth R/Ts looked the best to me though, and their additional rarity makes them particularly alluring. As an aside, this reminds me of just how much I loved this period of sports car styling. 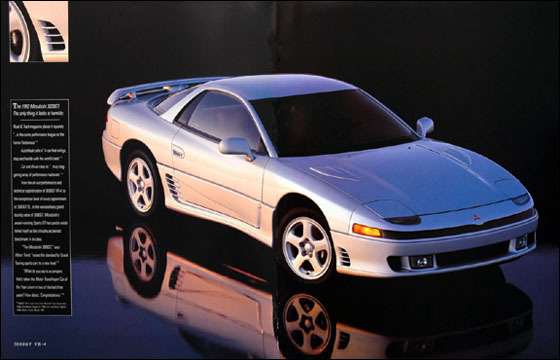 These 3000GTs and Stealths, the 92 RX/7, the 93 supra, the Acura NSX, Dodge Viper and even the 93 Camaro/Firebird, and 94 Mustang were just great looking designs and were catalysts to my already car obsessed young mind. It’s no wonder I became a car guy.